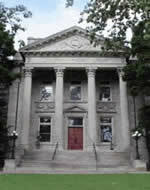 Pictured at left: The Carnegie Center for Literacy and Learning, our daytime venue. Parking: Registrants will be emailed a parking permit for the Transylvania Bookstore parking lot. 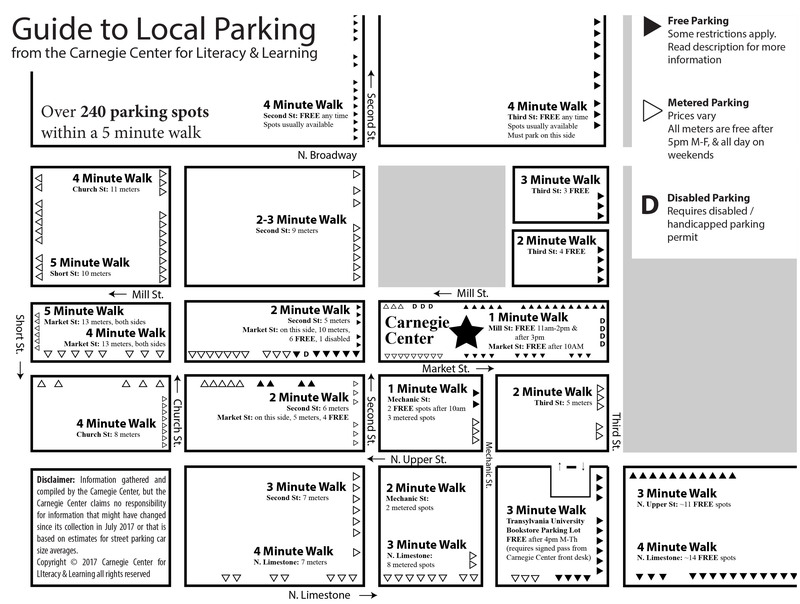 Here is a parking map of all options in easy walking distance of the Carnegie Center. All day Saturday and Sunday, free street parking is plentiful, as the street meters are not in use except on weekdays until 5 p.m. Located in the "Heart of the Bluegrass," Lexington sits at the crossroads of two major interstate highways, I-64 (east and west) and I-75 (north and south). Plan your stay using the visitors bureau website and see below for hotel recommendations and discounts. View driving directions to Lexington. The following hotels are listed in order of distance from the main conference venue at the Carnegie Center. The Sire Hotel (0.1 miles from Carnegie Center, formerly the Gratz Park Inn, thoroughly remodeled) 120 West Second Street, tel 859-231-1777. Conference registrant rate: $149/night plus tax. Book by Aug. 8, 2019. 21c Museum Hotel (0.2 miles to Carnegie Center) 167 West Main Street, Lexington, tel 844-301-4629. Conference registrant rate: $249/night plus tax. Use code KYWOMENWRITERS when making your reservation via this link www.21cmuseumhotels.com/lexington. Book by Aug. 21, 2019. Hilton Lexington Downtown (0.3 miles to Carnegie Center), 369 W. Vine Street, Lexington, tel 859-231-9000 or visit the KyWomenWriters room block web page. Conference registrant rate: $129/night plus tax. Book by Aug. 23, 2019. Hyatt Regency Lexington (0.4 miles to Carnegie Center), 401 West High Street, Lexington, tel 859-253-1234. Lyndon House Bed and Breakfast (0.6 miles to Carnegie Center), 507 N. Broadway, tel 859-420-2683. Holiday Inn Express Hotel and Suites (1.6 miles to Carnegie Center) 1000 Export Street, Lexington, tel 859-389-6800. $119/night, booking code KWW. The Inn on Broadway (2.0 miles to Carnegie Center) 1301 South Broadway, Lexington, tel 859-519-2060. Hampton Inn by Hilton (3 miles to Carnegie Center, near Southland Drive), 1953 Nicholasville Road, Lexington, tel 859-313-9019. Please ask for the University of Kentucky discounted rate of $114/night (aka the hospital medical rate). Four Points by Sheraton Lexington (4.1 miles to Carnegie Center), 1938 Stanton Way, tel 888.627.8157. Airbnb is an international Web-based agency for private home rentals. To book, visit this link. HomeToGo compares the best accommodations in the area, with no booking commissions. Visit: https://www.hometogo.com/lexington/. Homeaway is another Web-based private home rental company, at this link, though it appears to have fewer Lexington rentals than Airbnb. Some will list rooms through both agencies.